It’s the end of October – which, in Michigan, means APPLES! There is no shortage of orchards to go apple picking or, if you’re like me, to drive up and buy a few bushels of already picked apples while leaving the kids in their carseats! We LOVE eating fresh apples as well as baking with them (this apple cake is one of our favorites! 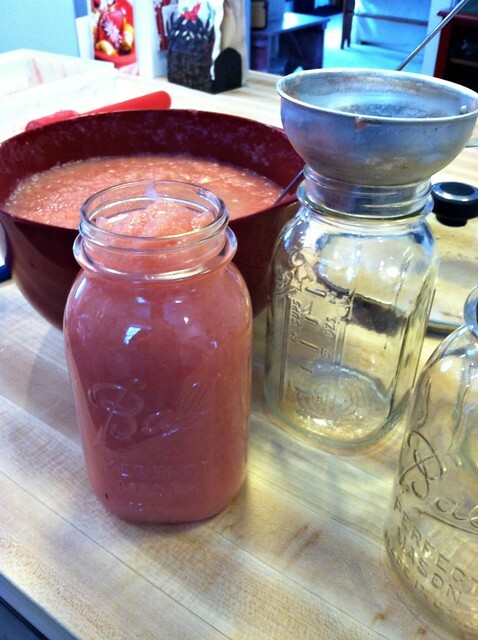 )… and of course, canning quarts upon quarts of deliciously pink applesauce. Well, maybe I don’t exactly LOVE the entire caning process, but the end results are worth it as we eat applesauce with almost every meal, and it’s super convenient baby food! Since it’s apple season here in Michigan (and many parts of the country) I’ve been getting lots of requests for applesauce canning posts and information; and although I’m not an expert, I can say that my mom, my grandma, and I have all been canning applesauce this way for years and years… and years. We’ve never been disappointed. 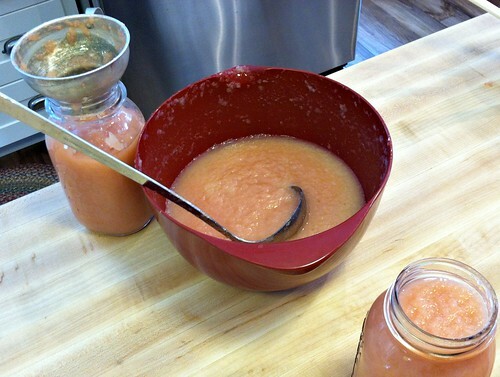 Almost two years ago, I shared a long tutorial about how I can applesauce — and since I just finished canning applesauce for this year, I thought it was time for a re-post. 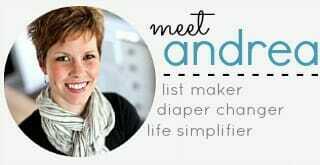 What I’m sharing below is mostly reposted from back in 2012 with a few new tips and links thrown in… however, I’m sure you’ll notice that Nora looks just a bit younger in these pictures! I don’t know about you, but the whole process of canning applesauce always seems so overwhelming to me… but once I’m finished, I realize that it really only takes a few hours for me to can enough applesauce for almost two years (and we eat A LOT of applesauce). Also, I’ve found that with canning, so much of it is learned through experience and “hands-on” training. So while I can’t give you a hands-on experience via my blog, I hope that the step-by-step photos and instructions below will at least be a good guide to help you get started! Step 1: Buy and wash your apples. I always get my apples from local orchards — it’s usually the most frugal approach to get large quantities of apples, and it’s also often the “freshest” option. We buy most of our fruit from Moelker’s Orchard. 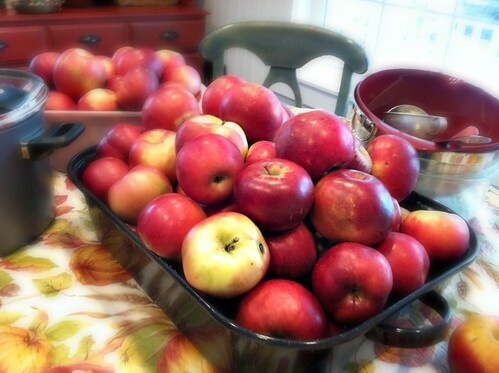 I almost always buy a variety of apples (the orchard will be able to recommend good “applesauce apples”). I personally prefer red apples to yellow/green apples and my favorite “blend” is Idared, McIntosh, and Empire. I usually can anywhere from 2 to 3 bushels (about 4-6 large paper grocery bags full). I’ve found that one bushel of apples gives me almost 20 quarts of applesauce — but this depends on how thick or thin you like your sauce, how big the apples are, how much you cut out of the apples, if you peel the apples before cooking, etc. Step 2: Cut the apples up. This is for sure the most time-consuming part — it works best if you either do it the night before and have helpers. 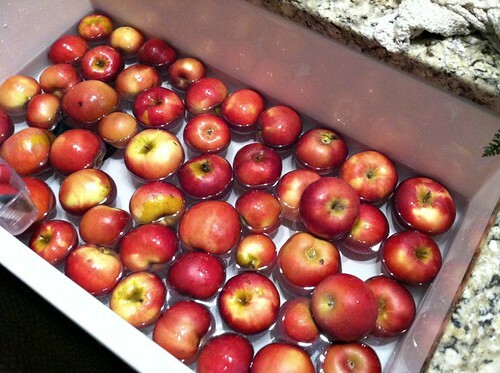 You can easily cut up the apples the night before and soak them in saltwater for a few minutes. Once you remove them from the salt water, you can put them in any pan or food storage tub and the flesh should stay white until the next day. 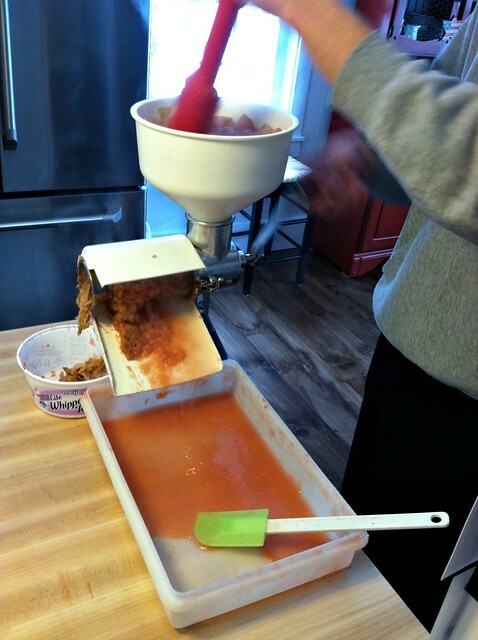 If you process the apples like I do in the food mill (see instructions below) you can leave the skins on — which will save you TONS of time, produce more applesauce, give your applesauce a deliciously sweet flavor, and a fabulous pink/red color. When you’re cutting the apples, the trick is to waste as little of the apple flesh as possible. 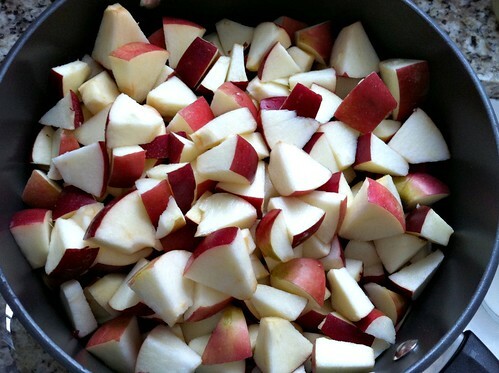 I cut the apples into quarters, cut out the tiny seed area, and then cut each quarter into 4 -6 chunks. This is a “sticky” process so I cover my table with an ugly plastic tablecloth. Step 3: Cook the apples. If you don’t have many large stock pots, you might want to borrow a couple. I often have 3 or 4 large pots cooking at one time to help the process go faster. Simply fill the pans to the top with chopped apples, add a cup or two of water (not exact at all — just to keep the apples from burning to the bottom), and boil until VERY soft. I stir the pans every few minutes and scrape the bottom so the apples don’t burn. Depending on your stove, your pans, how full your pans are, and how big your apple chunks are, the cooking process could take anywhere from 15-30 minutes. Step 4: Pour cooked apples into a large food mill. As I mentioned above, you’ll save yourself LOADS of time and get more applesauce by not peeling your apples before you cook them; but if you leave the peels on, you’ll need to run the cooked apples through a food mill to separate the peels. Then start cranking the handle and pressing down on the apples. The sauce will start coming out the bottom and the peels will be “discarded” out the side. I always run the discarded peels through the food mill once or twice just so I don’t waste anything! Doesn’t it look SOOOOO delicious! Step 5: Add water and/or sugar to the sauce. After I run the apples through the food mill, I dump the sauce into a large bowl and add more water if it looks too thick — this makes it easier to pour out of the jar and also helps to “stretch” the quantity a bit. You may also add sugar at this point — however I don’t think I’ve ever added any sugar to my sauce because the apples are sweet enough on their own. Step 6: Ladle applesauce into clean jars. I always use quart jars because we go through applesauce very quickly; however, if you’re worried you won’t eat it fast enough, you could use pint jars instead. I use one of these handy canning funnels specifically design for canning jars. They make the process so much easier — and much less messy! Just make sure all your jars are very clean (I run my through the dishwasher the day before) so no germs or bacteria gets inside the jars. Step 7: Put lids and rings on each jar. Once the jars are filled with applesauce (leaving about 1/4″ of headspace at the top of the jar) it’s time to put a canning lid on each jar and then secure the canning lid with a ring (make sure you have the appropriate size lids and rings for your jars — they come in both regular and wide mouth). Follow the directions on the boxes of lids as you’ll need to boil the lids for a few minutes before topping each jar to soften the seal. Once the rings are screwed on as tightly as you can by hand, you’re ready to process the jars — although you don’t necessarily need to to this immediately. I usually take some time to clean up the kitchen and get things put away before processing the jars (they can easily sit out on the counter for 24 hours or more). Step 8: Process the jars in a hot-water bath. This is the easy part… but it still takes a while. With applesauce and other non-acidic foods, there is no need for fancy (and expensive) pressure cookers. 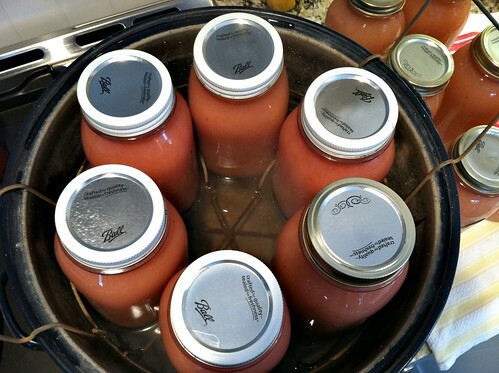 A simple hot-water bath canner like mine will do the job at a fraction of the price. A canner holds 7 jars (I only have 6 jars in the picture above, but you can put another jar in the middle hole) so unless you have access to multiple canners, you can only process 7 jars at a time. 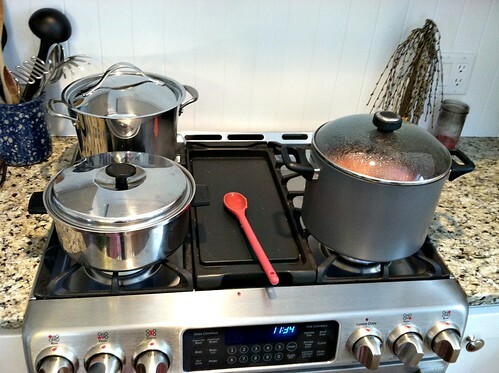 I usually like to have 2 canners going at the same time — especially now that I have a bigger, more powerful stove. However, you can easily manage with one canner. Once the jars are covered with water (just barely covered otherwise it will boil over). Put the lid on and turn the burner on high. It will take a while for the water to come to a full rolling boil, but once it does, set your timer for 20 minutes. After the jars boil for 20 minutes, turn the burner off, remove the lid, and CAREFULLY remove the jars from the canner onto towels to dry and cool. Let the jars sit for 24 hours and then make sure they’ve all sealed (they’ve sealed if you can’t press down on the middle “bubble” on the lids). Step 9: Wash and store the canned applesauce. 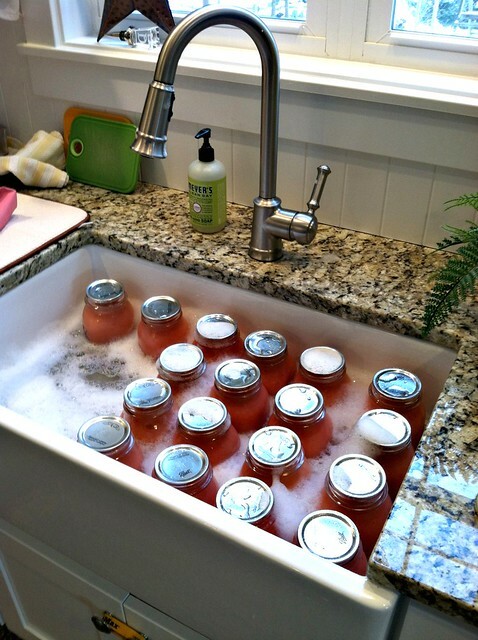 If the jars all sealed properly, you can then remove the rings (after they sit or 24 hours), wash the jars to remove any sticky residue, and store them in a cool place. If one or two of the jars don’t seal, you can just stick them in the freezer (they will last several months) or in the fridge (if you can eat it within a few weeks). That’s the whole process — and while I know it might seem overwhelming, it only took me 5 hours to do about 40 jars from start to finish. I did have my mom helping me for almost 3 hours, and Dave was home to watch the kids, but I promise, it’s not as bad as you might think. If you’re still not sure you can handle canning, just start small. Do 5 pounds of apples — which should probably make 2 or 3 quart jars of sauce. If you like it, do more. If you hate it, you won’t have wasted much. And if you don’t have time to can applesauce right now, don’t worry… you can usually get apples from the orchard until January or February, so you could save this project until winter (which is what I usually do). 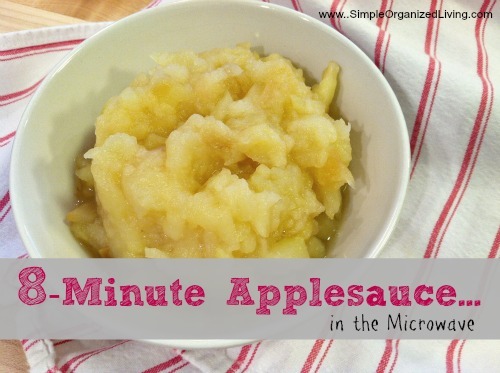 Finally, if you don’t have any canning supplies, consider trying my 8-Minute Microwave Applesauce recipe. What are your favorite ways to use up apples? Thanks for the great tutorial. I use a Sauce Master too for doing applesauce. I quarter the apples or cut them a little smaller if they are very large. I do not remove the seeds. They seem to just disappear. My daughter in law and her mom and sister and I did 200# of apple seconds. They are the type that can’t be sold in the store. Most likely they would go for juice. Not rotten, just dark spots. A bit of a deal if you can find them. 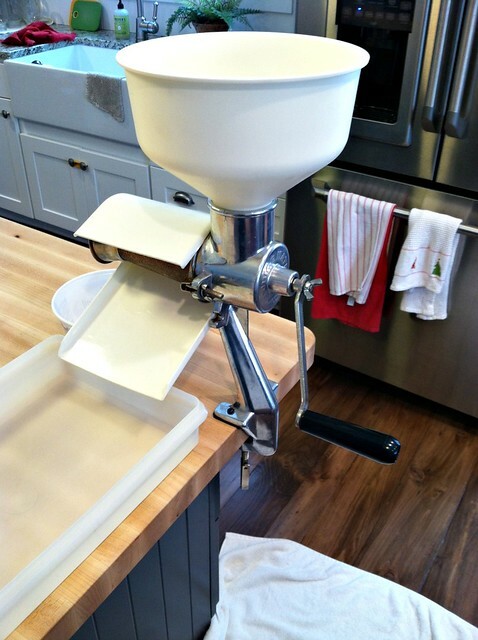 Have you ever considered a pressure canner? I reheat the sauce and put in jars. It does cut down the time. 5# of pressure for 5 minutes! We remember your Grandma and Grandpa with great appreciation and were sorry to learn of your grandpa’s death. My husband served the Jamestown CRC and performed the wedding ceremony of your parents. I know my daughter Pam is also a reader of your blog. We usually use mostly seconds as well — to save money! But we like mixing a few different varieties of apples in so if we can’t get all seconds we’ll just wait for something to go on sale at the orchard we use! Marcy and I have the same food mill as you. We do not core our apples. Simply cut the apples in quarters leaving the core and seeds in. They will come out with the peelings. Saves a ton of time. We used to use a apple section cutter which cuts the core out and the apple in sections. Not any more this is easier and works just fine. Ps we add cinnamon to our sauce. Every year, I tell my mom we should skip cutting the seeds out, but she refuses. She says it will taste bitter if we cook it with the seeds. I told her I’m going to try it next year! I’d love to know if you noticed a difference leaving the seeds in! I make applesauce with your method every year! we never leave the seeds in — mainly because my mom and grandma swear they can taste the difference and it really doesn’t take much time to just cut them out. Glad you like my “recipe”! Yes, this is definitely an option. I’ve tried leaving the seeds in and I swear, it makes the applesauce taste more bitter to me — but who knows, it might all be in my head 🙂 Thanks for sharing! Do you add any lemon juice to your applesauce? nope — usually I don’t even add any sugar either. Just apples and water if it’s too thick. Yummy! I love how yours turns out pink with the food mill. I use a corer-peeler-slicer to remove the skins and cores (and then I don’t have to chop anything) since I don’t have a food mill. Question: have you ever broken a jar in the canner? I broke one once and it about killed me to waste an entire quart of applesauce! And now I’m kind of scared to do it again because I don’t want to go to all that work and then have more jars break. 🙂 Is there anyway to check jars before the hot water bath, or to save the applesauce from the broken jar? 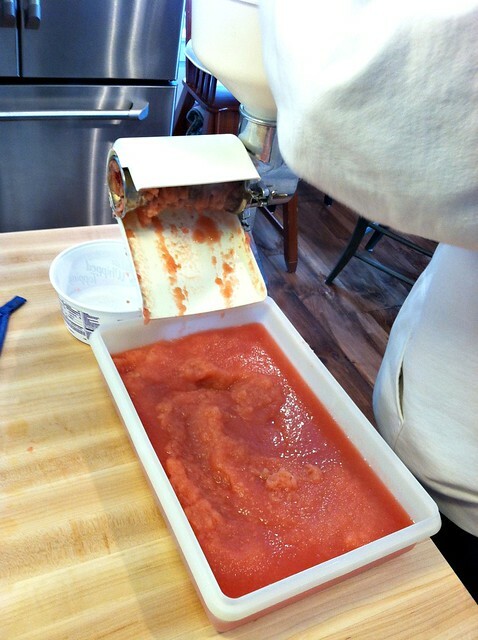 I have also frozen sliced apples to be made into applesauce when the mood struck–it was a good way to use up apples in season but didn’t take quite as much work because that was a busy season for us. I have not had any jars break — but I also dump out about half the hot water after each batch and fill the canner with half cold tap water. That way it’s only “very warm” water not “boiling” water when I put the new jars in. Cooling the water like that is a *fabulous* idea. 🙂 I will try it that way this year, because I’m going to need baby food again and don’t want to mess with thawing it 🙂 Jars are clean in the dishwasher and fingers crossed that our little one lets me get a lot done tomorrow! 🙂 Thanks! Worked great! Thanks 🙂 I also love the tip about filling all the jars at once and processing them a batch at a time. I always thought you had to fill with hot sauce and process right away. Much better this way! good, glad you had a good applesauce canning experience 🙂 And yes, it would be WAY to hectic to try to process the jars right after filling them. I usually clean up the entire kitchen, wash all the dishes, put everything away, take a little break, and THEN start the canning process. It’s so much nicer when I know that’s “all” I need to do. I do it the same way as you, but with 2 steps that make it even quicker! And I use the baby bottle sterilizer for sterilizing all the jars and lids. When making banana bread, I use applesauce in place of 1/2 the bananas, and always use 1/2 apple sauce instead of butter for baking. Saves so much $. I’m so glad you reposted this. We have been thinking of visiting Apple Hill here in California to get some apples. I have not done any canning in this house since we installed a convection microwave oven over the stove where an exhaust fan once lived. There is just not enough clearance for a canner. So I followed the link to the microwave method and noticed you used a pampered chef thingamajig to make the apple sauce. I have to confess my computer monitor is a 28 in tv set. 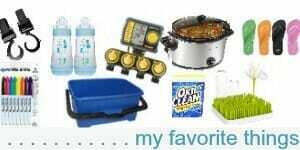 Good for noticing details haha so I noticed you pitched that pampered chef thing during your kitchen purge. I wonder what else would work? I was all set to buy a used on on eBay and get to apple making. I have a Foley food mill from eons ago and it works fine for small batches. 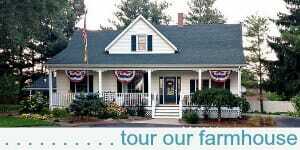 I’m rarin to go here, will be heading out in the motorhome to the foothills and the apples! soon. I was a day early! I used your tutorial yesterday to can applesauce after using it last year for the first time. Thank you for such an easy to follow tutorial! yay — glad it helped! Hope you enjoy your applesauce! When I can applesauce using the food mill I just cut the apples into quarters and leave the seeds in. This saves a lot of time. I’ve always debated on doing this or not — but my mom and grandma SWEAR that the applesauce had a bitter taste when they tried leaving the seeds in years ago. have you noticed that at all? I’ve never noticed a bitter taste, but then I’ve always done it this way. It might be worth it to try a small batch leaving the seeds in and see what you think. Seeds? Leave em out. My grandmother was a veteran canner. She said they were poison. I was curious about it so I googled. Dr. Google is our friend. Did not have that resource back in the 50s but my grandma was right! I like to cook mine with cinnamon on it. I never add any sugar either. Our favorite is just Jonathon apples. Enjoy your sauce! I do all my canning in the dishwasher. After filling and sealing the jars as you describe, I load up the dishwasher and run it through on a heavy pots and pans hi-temp scrub/sani rinse. I can fit 16 quarts and about 15 pints in one dishwasher cycle, and the jars come out clean and fresh. 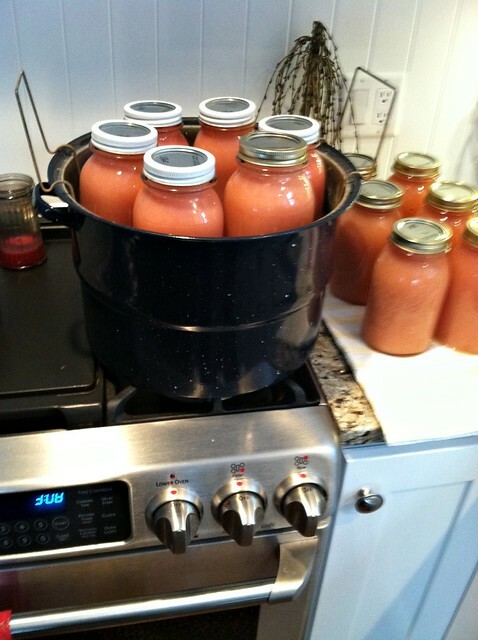 My neighbor introduced me to this method 15 years ago and have been canning applesauce, salsa, and tomato soup like this ever since! WHAT!!!! I’ve never heard of that before, but it might just change the way I can forever! I might have to try this some time this winter! One question though — do you still find you need to wash under where the rings are? Or does that somehow get clean in the dishwasher too? I don’t ever do that, no, though I usually wipe them down prior to putting the rings on. When my neighbor first told me about this, I thought she was crazy … until I tried it and found it worked beautifully! And if any don’t seal, can just put in a canner … which I never have had to do. You need the high temp scrub/sani rinse cycle on your dishwasher for the water to be hot enough to seal them. I no longer own a canner as this system is so much easier and quicker! Ok thanks Heidi — I am definitely intrigued by this! I’ve never heard of this either but it sounds like a fantastic time saver and won’t steam up my kitchen from boiling water for mega batches of canning. Thanks!! I do not think this is safe. A dishwasher does not get to the proper boiling temp for the correct amount of time. I would def check with ball canning or your local extension office for canning. I’ve gotten sick from improper canning & it’s not fun trust me. what do you mean by “turn dark in the jars”. Mine doesn’t change color much at all — but I do use all the skins for my sauce so it’s very pink/red in color compare to the yellow stuff you buy at the stores. Ask for seconds. They might have a few more bruises or black spots to cut out but overall the apple is still delicious and around half the cost. If you are local there is an orchard on Riley and 16th in Jamestown area that also sells apples for around the same price. For me it is more economical to purchase from them. Grand view Orchard is the name. Yes Stephanie — we ALWAYS get 2nds for apples… they are half the price (or cheaper. We go to Molker’s orchard in the Northern Grandville area because they send their kids to Dave’s school! With the addition of the bakery at Moelker I do go there more often. Good thing there only open for about 6 months! Kristen, we get all our apples from neighbours. There is such an abundance in our neighbourhood that so many end up being wasted. Once you know which neighbours or friends have apple trees, they’ll probably be grateful to have someone take some away. I know that’s how it works around here anyways (Alberta Canada). I’m wondering if you stick some unsealed jars in the freezer if you need to remove any of the sauce? My mom said I should do that, but I can’t imagine you wouldn’t have said so if it was necessary! You thought of everything else. I’ve honestly never had a jar of applesauce that didn’t seal — so I’ve never tried putting them in the freezer before. however, a pretty common “rule of thumb” is that if you put ANYTHING in the freezer, you need to leave room for it to expand. So yes, I would definitely remove about 1/8 to 1/4 cup of sauce before freezing — just to be on the safe side! Your tutorial is wonderful. We eat a lot of applesauce. I buy the unsweetened kind and add cinnamon which I love. Do you use organic apples? Thank you for all you do. A food strainer makes the best applesauce! I did want to mention that canning lids have changed in the last few years, and they no longer recommend to boil them. I usually bring a small pot of water to a boil, remove it from the heat, and then add the lids. If I am in a hurry, I might even just use hot tap water. I know of people who have boiled their lids and had seal failures. It has to do with the composition of the sealing compound. This is almost exactly the way I do it. I never add sugar to my apples. Our favorite is Jonathon. However we now live in GA (grew up in MI) and it is harder to get Jonathon apples. One of the things I do different is to put some cinnamon on my apples when cooking them. Makes the house smell even better. We have applesauce on the table almost every night too. I have one picky eater and she doesn’t eat many vegetables so she always has applesauce and I don’t feel bad as it has no added sugar. My mother always did her canning in the winter. She would freeze her pickings during the picking season and can in the winter. Her thought was that you were stuck in the house anyway and you wanted to make the house warmer during that season. 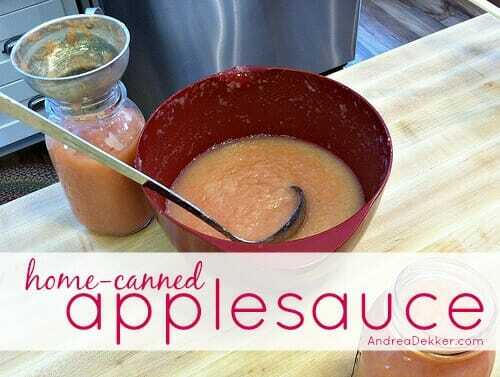 I love the applesauce canning process. I would love to try this. This is exactly the way I can apples and both my Mom and my grandmas canned. I have a apple core/peeler/slicer though. I had a lot of apple to do this year. It took me a little longer than usual but with four children under 5 running around what do you expect. Besides too large batches of applesauce, I also made apple butter, apple pie filling, fruit leather, apple desserts, etc. Now, I’m plannning to can some pears that I have (our baby will use some for baby food), as I was waiting for some rubber rings for my older jars passed down from my Nana. I guess I will start on them next week. I am always so amazed at the energy you have, especially with Faith being such a busy, non sleeping little girl! Of course, you are half my age, but I didn’t have as much energy even at your age :^). I’m originally from Michigan, so I really loved your t-shirt. I have made some radical changes in my life lately and one of them is to eat a raw food only diet ( I eat nothing cooked-only fresh foods) and was looking for an uncooked method of preserving applesauce and found one that is so easy. Maybe this will be an option for those who eat like I do or maybe they don’t want to take the time to can. This way is cheaper and less time consuming. Of course, I hate putting the in Ziploc bags that are contaminated with BPA , but at this point, I can’t afford to buy the ones that aren’t produced with the harmful chemicals. I just don’t understand why those of us who want to be as healthy as possible, have to pay out the nose? That’s another subject. It’s just 3 easy steps. 1) Core the apples 2) Put them in a Vita Mix blender and blend until your desired chunkiness or smoothness. The only thing I add is a little cinnamon, not only because I like the taste, but it also has healthy proprieties. To finish this super easy process, I put them in whatever size ziploc bags I want and freeze. Hope this helps those of who would be interested. I pray that your New Year will be blessed with sleep :^) and full of ALL THAT IS GOOD!! As always, I love your site….keep up the great work Andrea! We also started eating healthier (no MSG, high fructose corn syrup, artificial colors or sweeteners) so we cook a lot of meals from scratch. This would be nice to have on hand. I didn’t realize you can can a years worth of apple sauce in a day. Thanks for the information. I thought it ended up going faster and I didn’t lose much of the apple. Really like your site. I am trying to pin this post so I know where it’s at when I go to make applesauce but none of your images are able to be pinned. Why is that? Jamie — I don’t know why I keep having issues with this… but if you just click the “Pin” button at the bottom of the post it should work. For some reason, my flickr photos cause the issue even though my account is set to “Share” all my images. Thanks Andrea for replying so quickly. I used the pin button at the end of the post as you said and it worked just fine. Thanks! 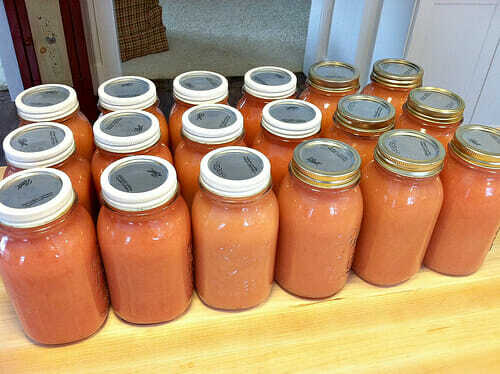 I make a lot of applesauce every fall; enough to last us through the winter and spring. We eat it almost every night at dinner too. I freeze mine though. My food grinder is pretty sturdy, so I just wash the apples and quarter them. I don’t bother removing seeds, my grinder separates it for me. I usually use 7-8 different varieties from a local orchard. I find that using so many varieties, I never need to add sugar. 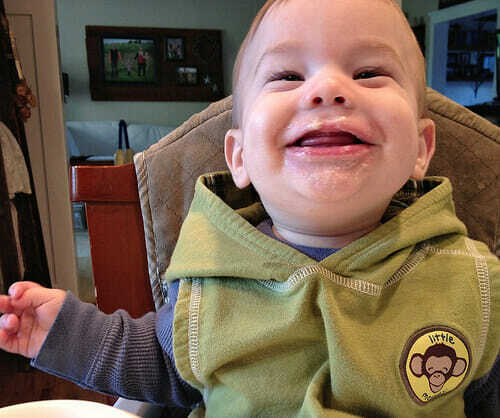 Oh yes – I love applesauce. We do 3 – 4 bushels a year, but I freeze it instead of canning it. I always just quarter the apples, take out the seedy part, and then cut each quarter in half again, skipping the chunking part. You might need to cook them a little longer – not sure. But it may save time in the process of getting them ready to cook. Otherwise I do it pretty much the same way you showed. It is the fruit I prefer to preserve – a lot easier than peaches or pears! I also freeze the applesauce in small disposable containers for school lunches. It is very convenient when packing lunches! The boys have the option of applesauce, blueberries, peaches, or crushed strawberries. They love it! Glad to see you have retained what is becoming a lost art! 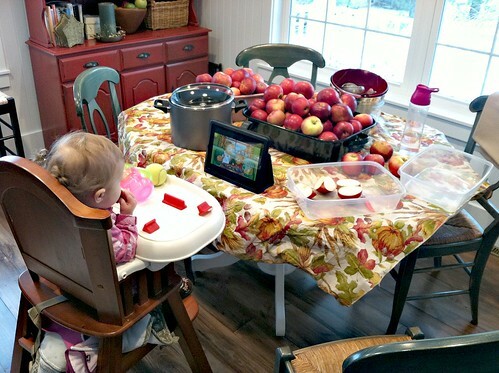 This year I tried softening the apples in the oven and it worked great! I used a large roasting pan with a bit of water and filled it full with apples. It was so easy to soften them in the oven and that way my stove top was free for the water bath canner. I was able to have a pretty good assembly line going that way. This is great! I’m hoping to start doing some canning in a few years, when we build our house and I have a big enough kitchen and a place to store canned items. There is a easer way to can. Where you dont have to do the water boil after you fill the jars. Boil the lids and rings. Get you applesauce to boil for 5 min or so. Fill your jars put on tops and rings. Flip the jars over onto a towel with the jars not touching for 5 min or so the flip the jars over. After a few min. You should start to hear them pop. If some dont just rewarm the sauce and fill again and flip. I have cut my canning time down by 20 min doing it this way. 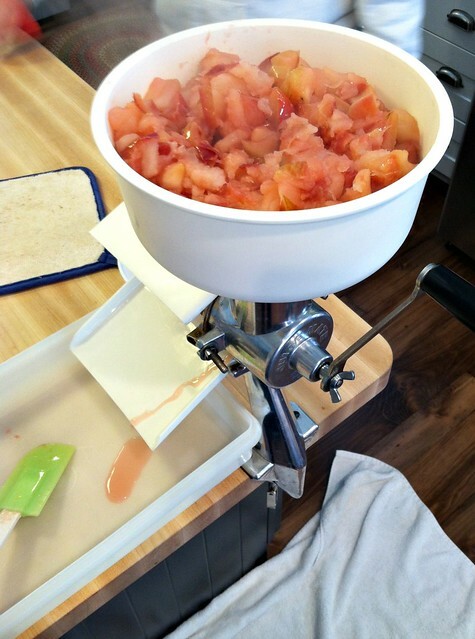 This is the method I use for canning jam — however it is not recommended for applesauce. The main reason is because it’s difficult to get the applesauce to a high enough temperature for a long enough time to kill any lurking bacteria. The applesauce would most likely burn if you achieved a hot enough temperature, and if you don’t kill the bacteria, the jars might seal… but the bacteria would be sealed inside and then your applesauce could still go bad over time. Might have to try this sometime. My kids would love it. I really like your t-shirt! Deanna, the apples are sliced very thin with the Pampered Chef peeler/corer/slicer. The apples will soften much quicker. Will that take away from the flavor by not cooking longer? I have this product. Just an FYI, if you use an apple slicer, peeler, corer, you will waste a ton of the apple. I basically just cut out the seeds and that’s it — it will take longer if you do it by hand, but you’ll get a lot more sauce. Also, I don’t peel my apples before hand — and the peeling give it a really great flavor and a fabulous pink color. With the Pampered Chef Peeler/Corer/Slicer there is no waste. But the slices are quite thin and do work well or an apple pie. I’m wondering if the thinness of the slices would diminish the taste. The peel usually comes off in one long strand so you could put the peel in the water and get the same color affect and just pull out the peels after the apples are cooked. Just wondering. I think I’ll have to try it. I speed the process up by not taking out the core and seeds. I run the warm apples through the food grinder and fruit/vegetable strainer attachments on my Kitchen Aid mixer. I do 5-6 bushels of apples into sauce this way. In Greece applesauce is not at all common. So i am curious. Where do you use it? We have applesauce on the table almost every single night (and yes, I totally understand if that sounds weird to a lot of people!) It’s like a condiment and/or side dish for almost every one of our meals. You can also use it for baking in place of oil, for jello recipes in place of water, or as baby food!